Drew, a fall 2015 CIMBA blogger, describes why you should study abroad early in your college career. Note: The following honors opportunities are currently available to University of Iowa students ONLY. Students from other universities who wish to receive honors credit during their time at CIMBA should speak to their home university’s honors college about available opportunities, procedures, and restrictions. Students at Western Michigan University who wish to receive honors credit for study abroad should review the honors information on their CIMBA & Your University page and contact the Lee Honors College for guidance. The University of Kansas does not accept honors credit for transfer courses. 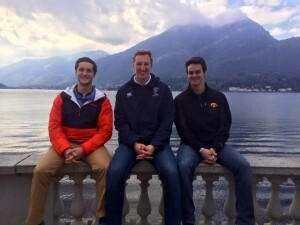 CIMBA, in conjunction with the University of Iowa Honors Program, is pleased to offer optional honors credit for University of Iowa students interested in studying abroad in Paderno del Grappa, Italy. Interested students must be current honors students at the University of Iowa in order to participate. Available during semester study abroad only. Students will be required to submit a 1-page proposal regarding an independent research project to be conducted during their time abroad. All proposals must be approved prior to the student’s departure for Italy. Project topics vary greatly and do not need to be related to the student’s major, but should utilize the study abroad location as a focal point of the research. Upon returning to the U.S., students will be asked to participate in a study abroad honors fair at the University of Iowa to present their research. Students who complete this option may receive up to 6 honors credits (non-academic credit). This option is coordinated directly with the University of Iowa Honors Program. Interested students should contact Andrew Willard, Honors Experiential Learning Director, to set-up an appointment during the semester prior to their departure to discuss potential topics and deadlines. Students should direct all questions and concerns to the University of Iowa Honors Program. Research is conducted independently and without supervision from the CIMBA staff. Available for semester and summer study abroad. See below for restrictions during the summer program. Students will coordinate an additional project for a class in which they are already enrolled during their time at CIMBA. This project will be based on a mutual agreement between the student and faculty member teaching the course and must be approved by the honors program by the 4th week of the fall/spring CIMBA semester or before departing for the summer semester using the contract approval form. To receive the contract approval form, students should contact Andy Willard directly. Students should review all requirements and deadlines in advance to ensure they will receive honors credit. Project topics and formats will be determined by the student and faculty member and must be related to the topic of the course. Students should abide by the deadlines set by the University of Iowa Honors Program. Semester students are encouraged to contact their faculty member to determine a project topic prior to their departure for Italy in order to maximize their time abroad. Summer students MUST have an honors project agreement approved prior to their departure for Italy due to the abbreviated course schedule. Should the student choose not to complete the independent or contract project or is unable to complete the assignment by the agreed upon deadline, they will not be penalized. However, the student will not receive honors credit.